Urban development over the last several decades in the United States has greatly increased the amount of impervious surfaces, such as streets, rooftops, and parking lots in urban and suburban environs. Rainwater from these areas is often contaminated with pollutants, such as motor oil, gasoline, heavy metals and nutrients. And since rainwater cannot soak into the soil, impervious surfaces also generate greater volumes of water than natural areas, leading to increased frequency and depth of flooding (Lane et al. 2015a). The use of stormwater wetlands solve both of these issues by holding water during storms, much like a retention basin, while also reducing pollutant concentrations in the water column. Below are several stormwater wetland projects that Comite Resources has designed and monitored. 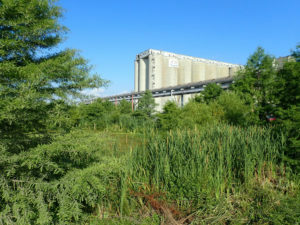 The south pond stormwater wetlands at CHS, inc.
CHS, Inc. is a bulk grain transfer terminal located south of Myrtle Grove, LA directly on the west bank of the Mississippi River. During rainfalls, grain dust from the facility washed into drainage ditches where total organic carbon (TOC) concentrations regularly exceeded the LPDES permit limit of 50 mg/L. In an effort to reduce TOC concentrations from the stormwater runoff, CHS implemented aggressive stormwater management practices and regular cleaning of earthen swales and other areas. Despite these changes, TOC concentrations continued to exceed permitted concentrations. In response, Comite Resources designed and directed construction of two ~2-acre stormwater wetlands directly north and south of the facility. Several hundred baldcypress seedlings were planted along the edge of the ponds and weirs were installed to control water levels. Herbaceous wetland vegetation established itself naturally, and alligators and a large population of whistling ducks, along with other wildlife are also currently using the ponds. Stormwater from the CHS facility is now routed through these wetlands prior to release into the local drainage network. Comite Resources monitors the wetlands for TOC reduction and vegetation growth and health. Influent TOC concentrations are at times as high as ~300 mg/L, but outflow effluent TOC concentrations are consistently below 40 mg/L, demonstrating that these wetlands are effectively reducing TOC concentrations of surface water runoff. Comite Resources partnered with St. Tammany Parish to develop, install and monitor a floating wetland to reduce nutrient and sediment concentrations of water flowing through the stormwater retention pond of the Del Sol subdivision in Covington, Louisiana. The floating wetlands were constructed using PVC with a mat constructed of vinyl-coated crab wire and planted with maidencane and other wetland vegetation such as southern swamp lily and southern blue flag iris. Approximately eighty baldcypress and fifty water tupelo seedlings were planted along the edge of the pond (survival rate >90%). 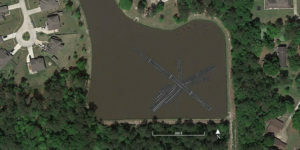 Post-construction water quality monitoring showed that the floating wetland significantly reduced nitrogen and phosphorus concentrations of stormwater and improved water clarity over the course of the study. These reductions are proof-of-concept that constructed floating wetlands can be retrofitted into stormwater retention ponds for water quality improvement. As part of recent renovations, a wetland was constructed to decrease urban stormwater runoff from the parking lot of the Woodlawn High School (WHS) of the East Baton Rouge Parish School System. 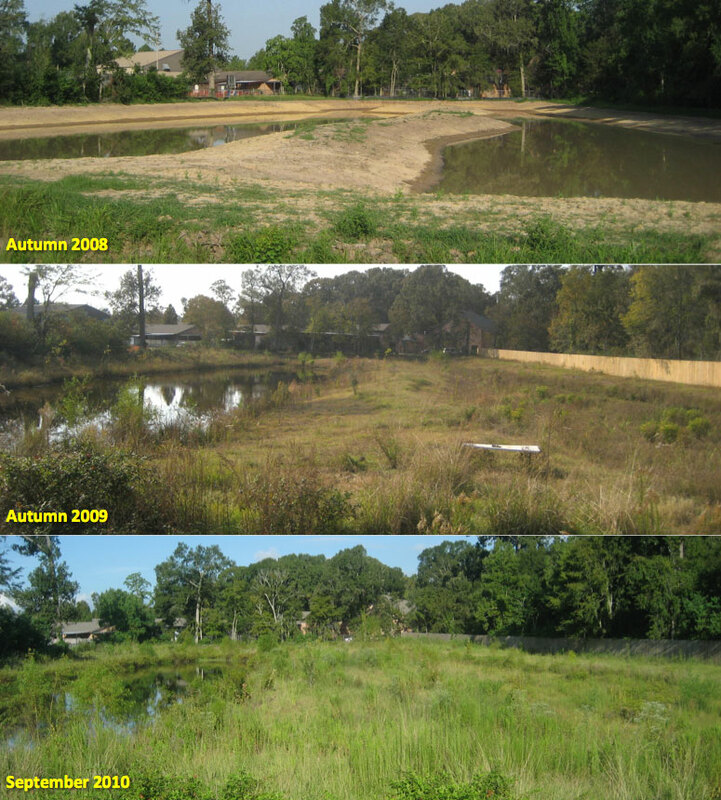 Originally a simple detention pond system, Comite Resources transformed it into a wetland to reduce the volume of stormwater runoff, increase residence time, uptake and sequester nutrients, and provide an educational training ground for schools. To create the wetland, our team constructed a meandering serpentine channel in the detention pond, planted wetland vegetation, and installed a weir drainage system at the far end of the detention pond to maintain a minimum water level within the created wetland. The meandering wetland channel was designed to be an aesthetically pleasing landscape feature as well as a functioning wetland filter, demonstrating the integration of landscape design with stormwater management and non-point source pollution mitigation.